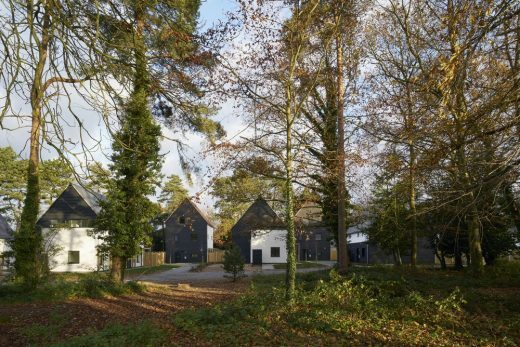 A Buddhist Retreat Centre in the heart of the Suffolk countryside and a local authority’s first housing development on the outskirts of Norwich are amongst a record seventeen buildings to win one of this year’s RIBA East Awards from the Royal Institute of British Architects, in recognition of their architectural excellence and contribution to society. From the 17 regional award winners, a number of special awards have also been announced. 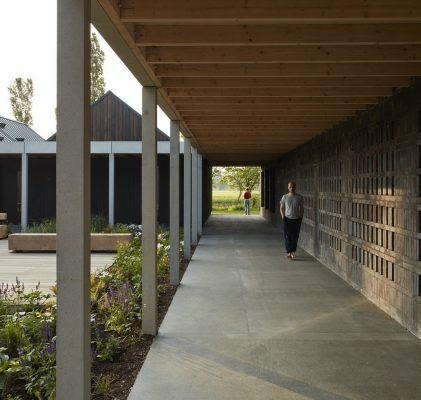 The ultimate accolade of RIBA East Building of the Year 2017, sponsored by Marley Eternit, has been awarded to Vajrasana Buddhist Retreat Centre, Suffolk, by Walters & Cohen Architects. The Enterprise Centre, University of East Anglia, Norwich by Architype picked up two special awards – the RIBA East Sustainability Award sponsored by Geberit, and the clients, Adapt Low Carbon Group & the University of East Anglia, were named the RIBA East Client of the Year, sponsored by Tobermore. 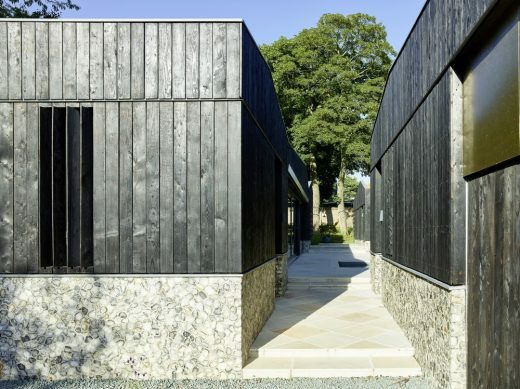 The RIBA East awards jury were unable to split two outstanding conservation projects and so the RIBA East Conservation Award, was awarded to both St Albans Abbey by Richard Griffiths Architects, and Holkham Hall Stables and Pottery Building by Hopkins Architects. 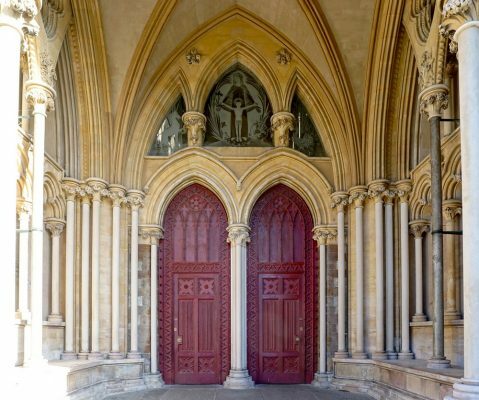 In addition to the Conservation Award, Richard Griffiths also picked up the RIBA East Project Architect of the Year Award, sponsored by Taylor Maxwell, for his work on St Albans Abbey. 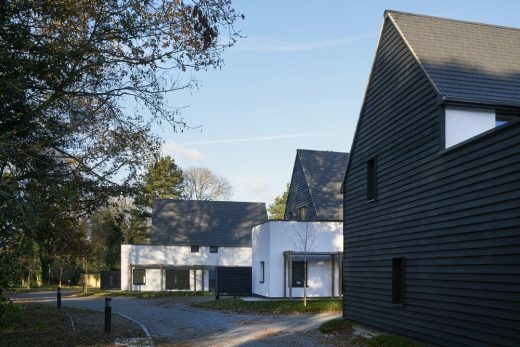 Last but not least, the RIBA East Small Project of the Year went to Redshank in Essex, by Lisa Shell Architects Ltd with Marcus Taylor. The Awards were presented at an awards ceremony at Fitzwilliam College, Cambridge this evening (Thursday 18 May 2017), hosted by Nicolas Tye, RIBA East Regional Chairman, and Awards Jury Chairman Anthony Hudson of Hudson Architects, with keynote speaker Alan Vallance, RIBA Chief Executive. 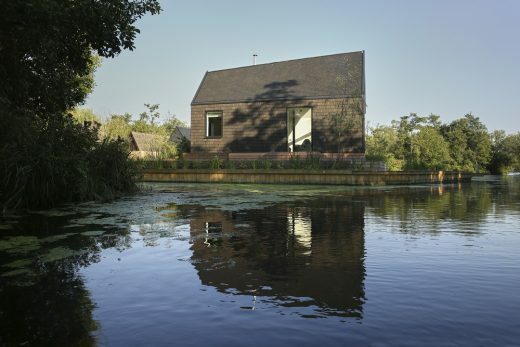 This exquisite building for meditation is found in the midst of the Suffolk countryside. 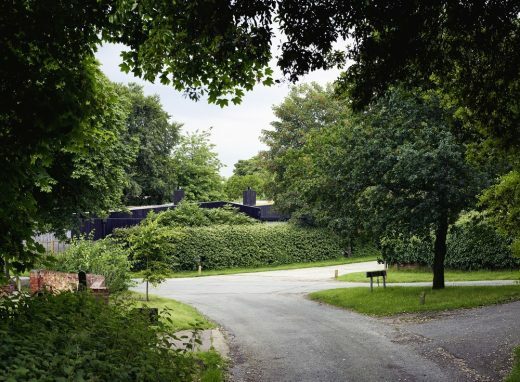 Although predominantly inward facing around courtyards it connects to the landscape beyond with views from shared communal rooms and bedrooms much as a monastic settlement might. It is a perfect setting for a Buddhist Centre. Considerable research went into the development of this primary school, taking best practice from across the globe on teaching methods since it is also a training school. It is an ambitious project and staff are clearly proud and delighted with the resultant building. 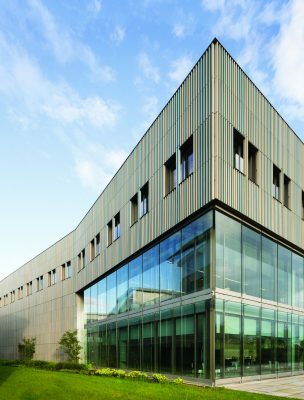 The building matches in architectural quality the innovation that goes on inside it -The Welding Institute (TWI) is a world-leading organisation dealing with joining technology at every scale. This is a large building and the scale successfully mediates with its context. 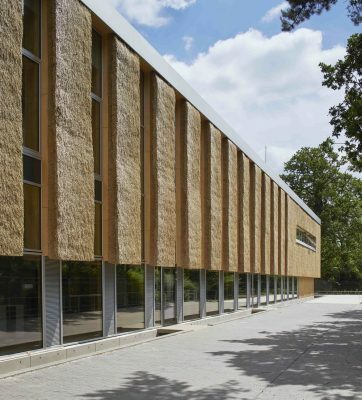 This is an ambitious project that set out to be the first Passivhaus office building in the UK, to source low-carbon materials locally and explore the idea of a contemporary vernacular. A lot has been learnt on the way and the learning process has been as important as the end result. It has achieved much of that ambition and is exemplary. It is good to see such a high quality housing scheme sponsored by a local authority. 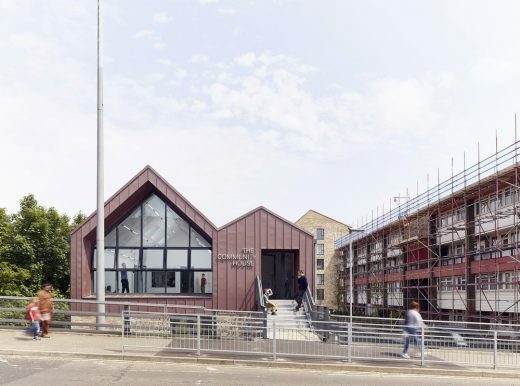 This is Thurrock’s first development in an ambitious new housing programme and the architect was involved from the start in advising on potential sites. 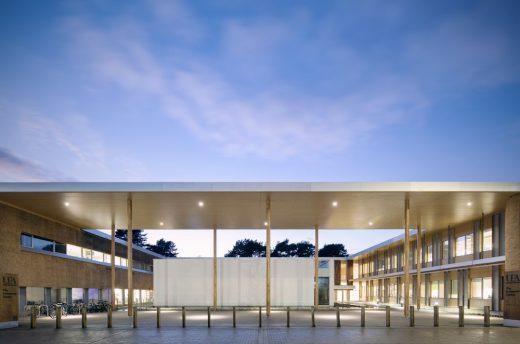 Such a close collaboration between architect and local authority has been rewarded with a bold architectural response. The site is triangular and sandwiched between railway track and access road. 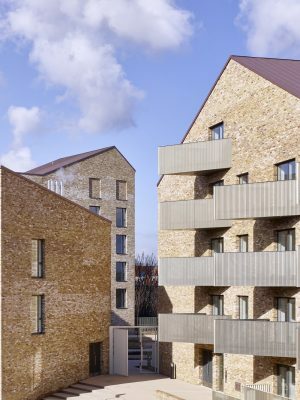 The layout of the three blocks makes the most of the context by reinforcing the urban form of the street, creating a courtyard at the rear and providing all flats with southerly or westerly views. These are entered off the gated courtyard which is accessed via a ramp and steps that fit neatly between two of the blocks. The roof profile varies along the length of the street which means that height can be gained without being oppressive to the street below. 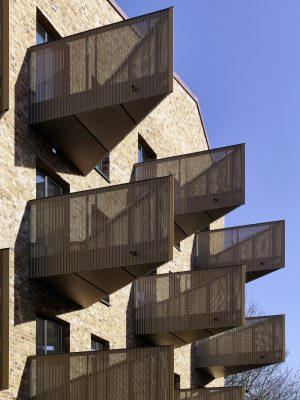 However the most distinctive feature is the triangular balconies, the majority of which face south with a few having breathtaking views over buildings to the Thames beyond. These work well viewed from the outside and are generous to use, adding a lightness of touch. They relate to living spaces that are on the south side with bedrooms predominantly facing north so all flats are double aspect. 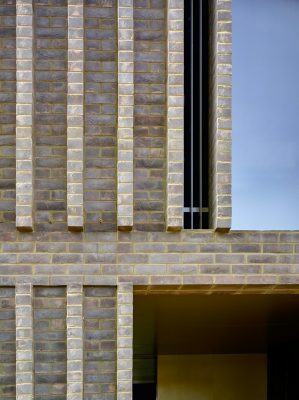 The level of brickwork detailing is exceptional and considerable attention has gone into junctions, soffits and jambs to give a robust high quality building. Equally the balconies are cleverly detailed offering some transparency but also concealing day-to-day clutter from the outside. This is an impressive addition to Thurrock’s housing stock that has met the challenges of an awkward site in a playful and imaginative way. 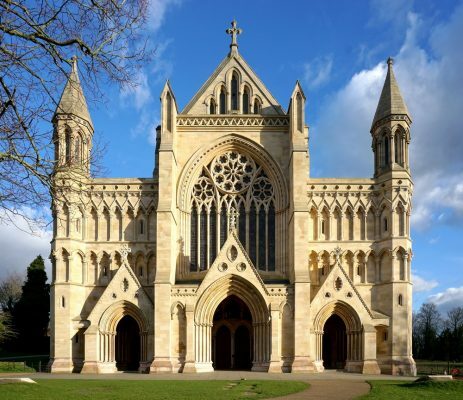 Richard Griffiths’ work at St Albans Cathedral and Abbey Church covers a wide range of conservation projects from repair to small scale interventions. He has provided a guiding hand on the direction of this work over a considerable time in an intelligent and sensitive way that has avoided pitfalls of excessive and damaging restoration as well as suspect reconstruction. From discussions with the client it is obvious that this guiding hand has been much appreciated and his work highly regarded. 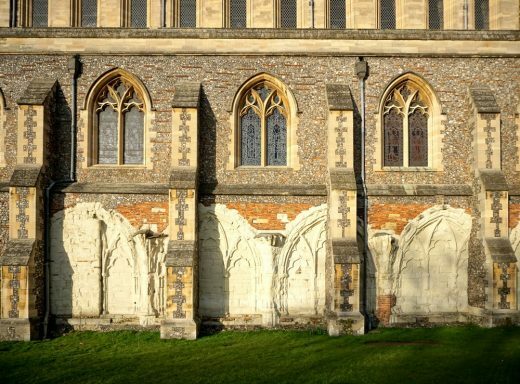 The conservation work has included preserving the deteriorating medieval clunch masonry of the original cloisters and the cleaning, conserving and lighting of the 13th Century west porches. He has overseen the conservation of medieval wall paintings as well as exposing the glories of the Lady Chapel which were concealed under layers of grime built up over a hundred years. Improvements have been made for better access throughout the building. These interventions are all discrete, particularly at the western entrance where new ramps lead up to the porches. Inside it has been a challenge because of the multiple levels consisting of a total of twenty-two steps in various locations but ramps and lifts have been successfully integrated. 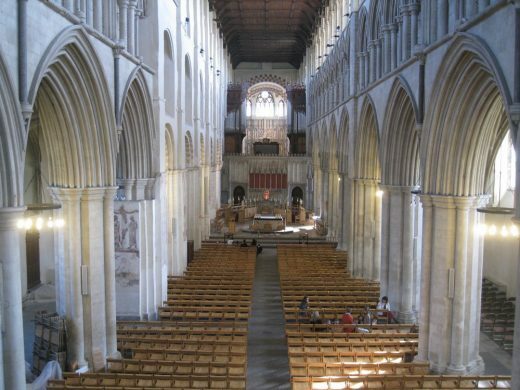 The layout of the nave has been altered to allow for better liturgy that includes new furniture, raised platforms and creating a processional route between nave and choir. 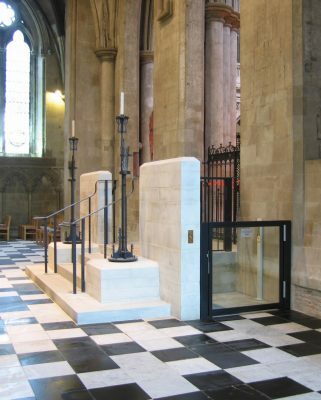 All these are reversible and furniture can be cleverly stacked away to allow the flexibility in use that the Cathedral requires. To suit new requirements the choir stalls have been extended. On first impression this looks invisible yet there are clues designed in that allow a reading of the original format. As a body of restoration, repair and sensitive small interventions with an intelligent overseeing approach, this is exemplary conservation work. 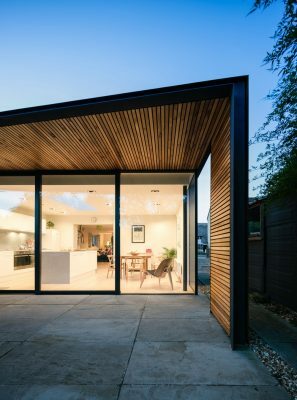 This is a small but exquisitely detailed addition to a house providing the owners with an extended internal living room and generous covered external living space. 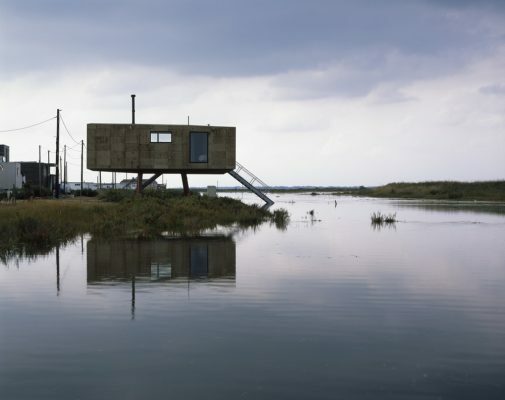 This is a contemporary house making a bold architectural statement on a sensitive site overlooking the River Alde estuary in Suffolk. This house shows that good modern architecture can sit comfortably and modestly in a suburban street through a contemporary reinterpretation of neighbouring forms and details. Internally, and in contrast, the house displays flamboyance in its open living spaces and stair hall. Externally the brickwork harks back to the Arts and Crafts tradition prevalent in the area, with blind arcade brick detailing and windows symmetrically placed. 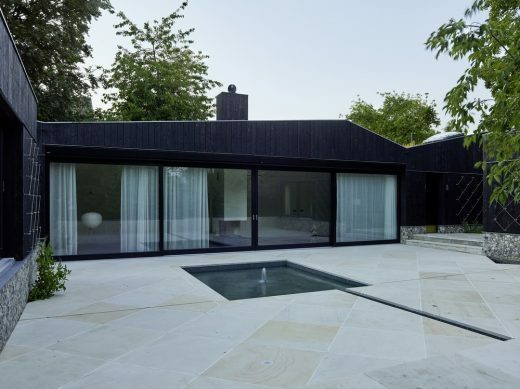 As a counterpoint, in form and material, black charred timber clads the outside of the staircase, conceals the necessary garage and, returning along the flank wall, wraps around the single storey rear extension that engages with the garden. This is cleverly handled and pulls together what might have been discordant parts of the building. 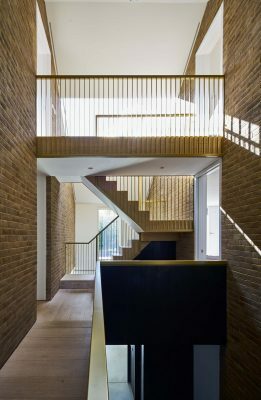 On entering the house the stair hall reveals the full height of the building in a dramatic but controlled way through use of black stained oak panelling that gives way to exposed brickwork: all reflecting themes on the exterior. 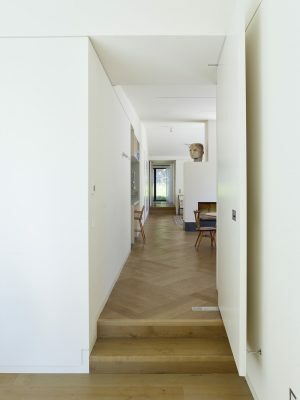 The hall leads to the open plan living area – the most idiosyncratic space of the house. 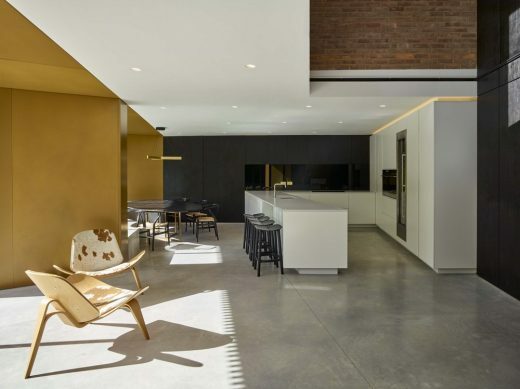 It is orientated at an angle to the garden to make most of solar orientation and has a scalloped cast concrete bench to the dining table adjacent the kitchen with a sitting area beyond focussed on a fireplace. 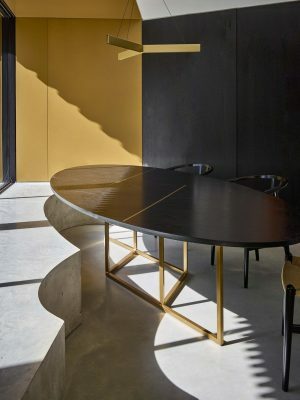 There is a rich play both of volumes and materials with a vertical visual connection to the main staircase emphasising that this is a shared family space. The material palette is concrete, oak panelling, bronze metal panels and brickwork at the higher levels. This could have been excessive but it works. In contrast the remaining accommodation consists of straightforward rectangular plastered rooms. Overall the project has been well considered and hopefully will inspire others, locally and further afield, to explore different ways of approaching the suburban house. Contractor company name: Conamar Building Services Ltd. This is a house that, with an opaque outside, conceals a series of wonderful internal and external spaces that are delightful and extraordinarily consistent in their detailing. The house, in the suburbs of Aldeburgh, is in a wooded area surrounded by other properties without any particular outlook. It is therefore entirely appropriate for it to be inward looking around a courtyard. The arrangement of three building blocks is extremely simple, consisting of main living spaces, study and a studio. These all have consistent and immaculate detailing using a restrained set of materials. On arrival very little is revealed other than the horizontal layering of materials consisting of a flint base and timber panelled middle, visually separated from a similarly panelled upper roofscape by a simple flashing detail. Occasionally a panel of brass enhances this composition. These datum levels serve as a constant reference point, help create vistas and play with perspective against terraces and floors that rise over the depth of the site. This is most effective on entering the courtyard which then reveals the house as a whole. This theme runs consistently around the whole house and is replicated internally with a hanging rail within the plastered finishes. The plan looks rigorous, yet because of the subtleties in different floor levels and roofscape the rooms all have an individual and particular feel. The main living space is generous, opening out through large sliding glazed doors onto the courtyard, being a living space in its own right. There is a nice play of serviced spaces against living spaces keeping the latter concealed as well as movement from one building to another. Intimacy of use has been achieved by keeping guest rooms at the edges of the plan allowing the bathroom, for example, to open up to the garden. 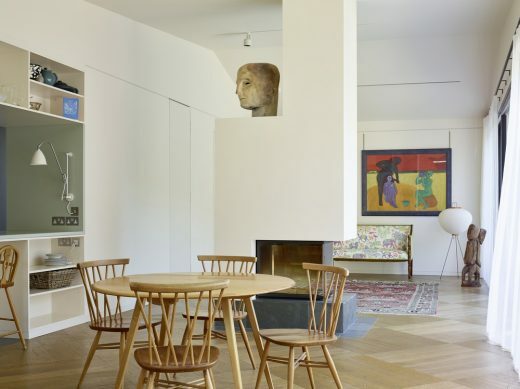 The interior finishes are mostly plastered with the hanging rail creating the datum line around the house, off which is hung the owner’s collection of art. An easily accessible art store allows the collection to be inter-changed as required. Particular attention has been given to the overall layout and roofscape to avoid disrupting views from neighbouring properties and the sedum roofs add to the overall calmness and subtlety of the project. The house is an accomplished work of architecture, whose overall simplicity in plan, elevation and detail belies an intriguing complexity in both internal and external spaces. 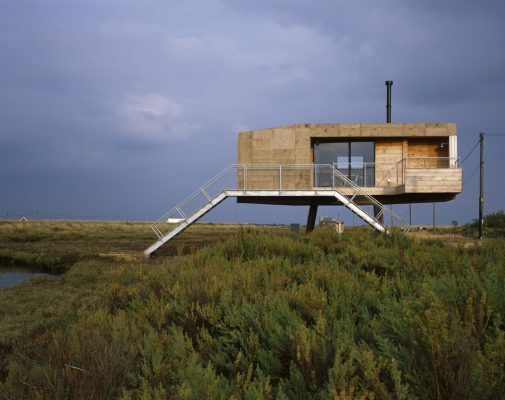 The building is an extraordinary structure, like other extraordinary structures on this part of the Essex coast, which hovers over the reclaimed marshland. 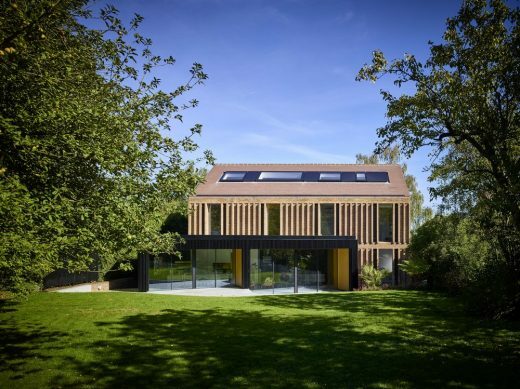 It is a small, beautifully detailed and conceived house that has dealt with the considerable challenges presented by the site in a seemingly effortless way. On approaching the house it is like being in contact with a Maunsell Fort. 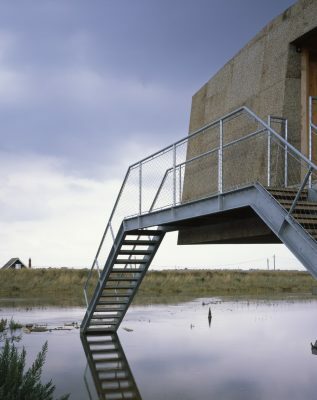 The steel tripod structure holds the house pod in the air whilst cleverly concealing all the service connections of power, water and sewage. This allows nature to reclaim the ground below back to marsh. A galvanised steel staircase abuts the structure giving access to the house as though one or other has temporarily docked. The house enclosure is formed in CLT. This is well crafted and detailed and left exposed on the interior. Being externally insulated in cork might at first be a surprise but it is all part of the innovation and integrated design that has gone into the project. The cork clads walls, roof and underside, reinforcing in a slightly different way the idea of a floating object. 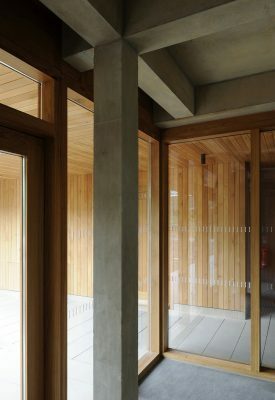 An external balcony with built-in seating is in oak and this visually invades the cork cladding thereby making the composition work as a whole. Nesting and bat boxes have also been cleverly incorporated. Internally there are only three rooms, living, bedroom and bathroom, but each is immaculately detailed making the most of the CLT structure. 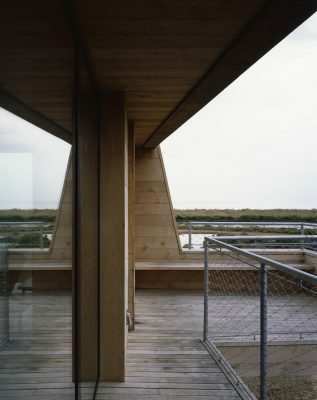 Each window is proportioned according to the importance of the view and function: from the large sea facing window Maunsell forts and wind turbines can be seen, the kitchen window frames views of the approach and doors onto access deck overlook the marsh and estuary. 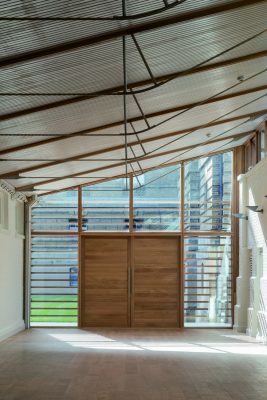 A secret CLT sliding door opens onto the west-facing balcony for passing through of food and drink. All the elements of the building are integrated into a whole that is a great deal more than sum of those parts. 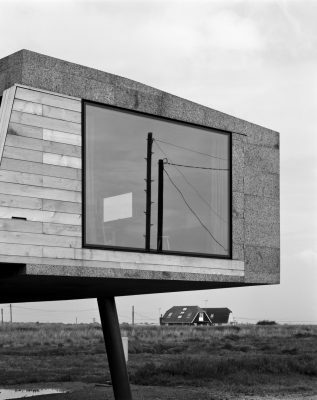 It is a pleasure and a surprise to see this exceptional house in this marshland landscape. 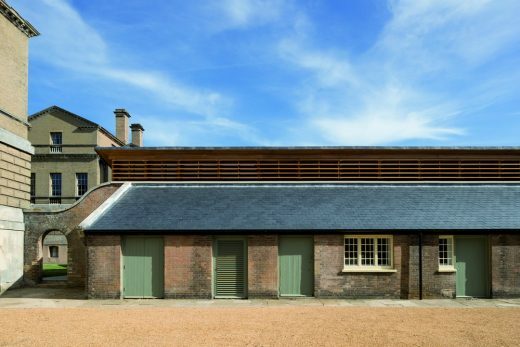 Two separate buildings at Holkham Hall form part of this submission. The stables building has been rearranged and improved to provide an exhibition space, new shop and expanded cafeteria and is well handled. However, the most significant interventions have been made on the pottery building where various disjointed spaces have cleverly been brought together to form one large light filled venue space for weddings, banquets and conferences. What was originally a bowling alley and then became the pottery consisted of a long rectangular building. This was separated from outbuildings by courtyards on both sides. The new building now encompasses the two courtyards and brings the outbuildings into use as service areas (kitchens and store rooms). The boldest move has been to remove most of the flank walls to the bowling alley and replace with a new open colonnade connecting the central space to the adjacent courtyards so creating a large open area. The design was accomplished using precast concrete columns and beams with a new string bow roof structure over the courtyards. This is sympathetic to the original steel trusses of the bowling alley. Light is brought in at a new clerestory above the outer courtyard wall giving an even wash over the new space. 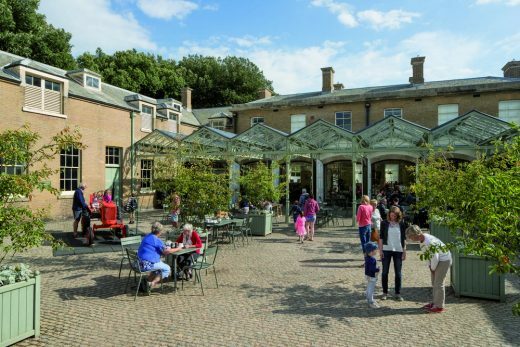 Overall the detail is of a high standard and the conversion is a clever and bold reuse of the existing buildings, giving Holkham Hall another venue of which it can be truly proud. 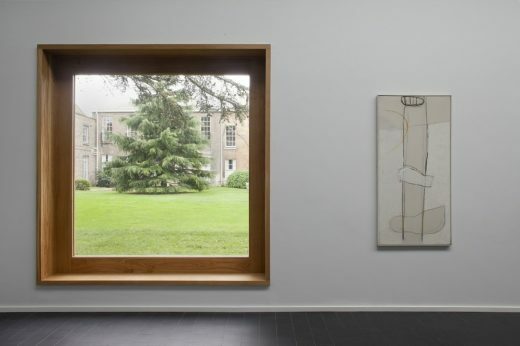 An unloved area of Downing College consisting of unremarkable buildings has been transformed into an understated but elegant gallery with a well-detailed forecourt. This new hall of residence captures much of the ethos behind the original design for Churchill College but gives us a bold and extremely well thought through contemporary interpretation of it. 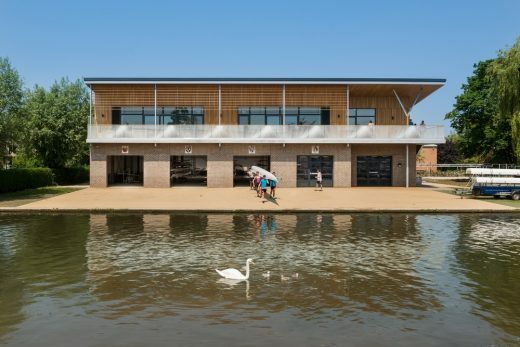 An incredibly simple brief for a boathouse has resulted in a commendably straightforward building designed and executed in an elegant and beautiful way. Four bays of the building provide storage for rowing boats for four colleges and a fifth bay acts as a workshop. The ground level is encased by brick and designed to deal with flooding. This is surmounted by a lighter weight structure clad in oak panelling that accommodates changing and fitness rooms that overlook a generous terrace. 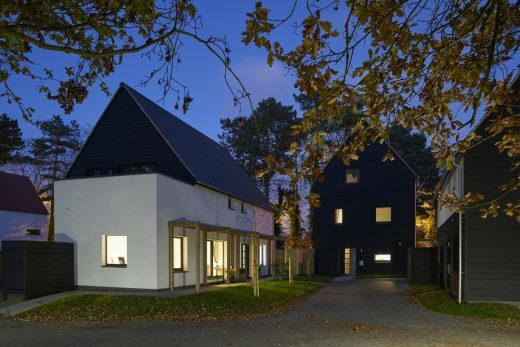 This project for fourteen Passivhaus homes is applauded for setting a new benchmark for local authority housing in the region. 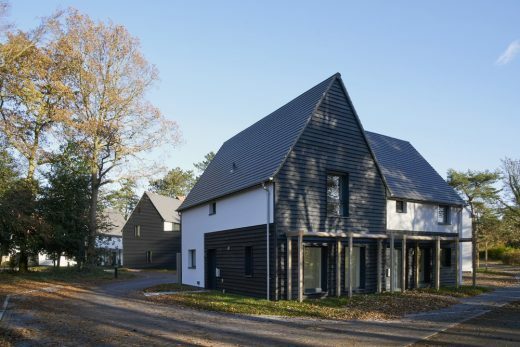 It combines a mixed but blind tenure scheme, with 43% affordable housing and passivhaus certification together with a layout and design that is above the usual expectation. It has also considered biodiversity carefully and provides woodland paths and an animal haven. Houses either face onto the road or are in groups of three, with two storeyed pitched roof buildings flanking one of three storeys, providing a good sense of place. Forms are simple but are given variety with single storey projections providing first floor terraces to bedrooms. 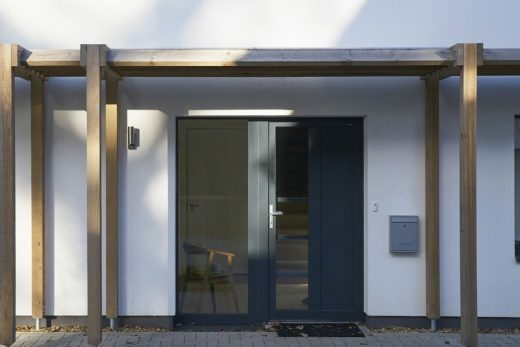 A simple palette of materials of render and timber boarding is used but applied in different formats thereby giving a variety of external treatment. Timber pergolas provide shading on the southern elevations and further enhance this aesthetic. It is an approach that creates a clear identity for the scheme without fussiness. Internally houses have good natural light and attention has been given to views out with low cilled windows in living rooms. Resident feedback has been very positive regarding both the use of the homes and significantly reduced energy bills. Energy use is being monitored and it appears all expectations are being met. Considerable attention was given to construction techniques and a clay block system was adopted which gives the houses added thermal and acoustic efficiencies with a design life of one hundred and fifty years plus. This is an ambitious scheme for local authority sponsored housing and is an exemplar for more local authorities and developers to follow. The house is found down a long winding track that penetrates deep into the Norfolk Broads at Wroxham. In the tradition of many houses on the edge of the Broads waterways it is low scale and bungalow-like with terraces overlooking the water. This house does it with aplomb. From the entrance front it appears as three gabled bays harking to the roof forms of adjacent boat sheds. It is quite modest in appearance whereas the waterside elevations open up to the sun and views in a spectacular way. The three bays reflect the internal organisation of the house: living space with study tucked behind, kitchen and dining area occupying the central bay and in the final bay, bedroom accommodation. Each bay is angled and exploits the numerous vistas that surround the site in an effortless but enchanting ensemble, with windows that are well placed and proportioned to their outlook. The relaxed and calm way that all the spaces of the building relate to each is the secret to the house’s success. It can be opened up as free flowing space or closed down as individual rooms to suit the particular demands of day, family or visitors. Externally the forms of the roof result from the trapezoid plan shape and are well handled, with only two of the gables appearing on the waterside. This gives the house a very different feeling front and back with deep roof overhangs over terraces. 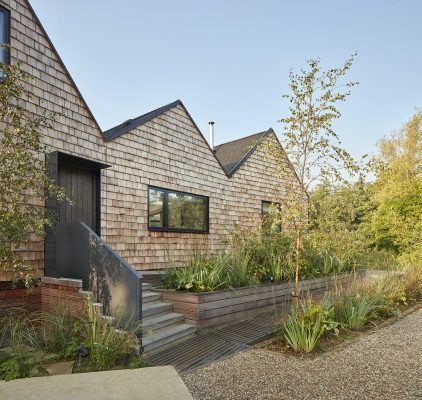 Cedar shingles are used throughout but with a subtle distinction between the walls, that are untreated and will weather, to those on the roof which are stained black that also helps to further emphasise the recessive elements of the house. There is interesting complexity in the shape, form and layout but it feels effortless in its realisation. This house is a delight. 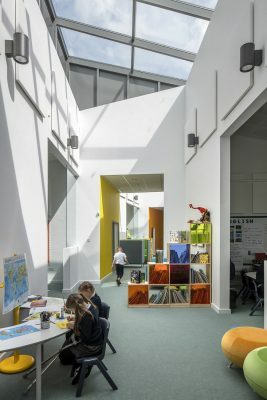 RIBA East today announced that it has shortlisted 31 projects for this year’s Royal Institute of British Architects (RIBA) Regional Awards, the most ever to reach the second stage of judging. 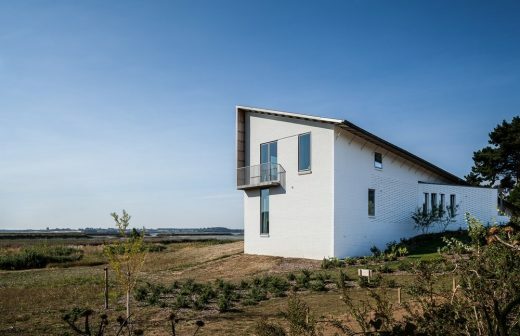 Amongst the shortlist is a drawing studio on stilts, the conversion of a derelict windmill into a holiday home, and a number of new housing schemes, all in the running after being shortlisted from a record number of 62 entries. 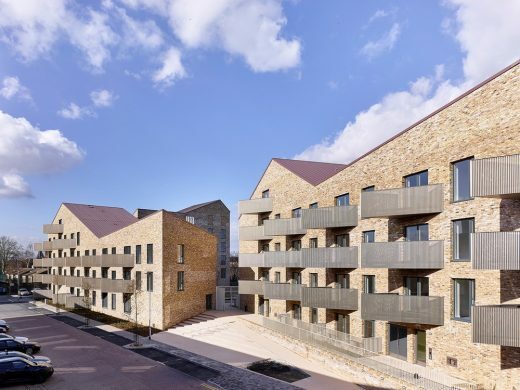 All shortlisted buildings will be assessed by a visiting jury during April, with the RIBA East regional award winners being announced during the evening of Thursday 18 May at a celebratory event at Fitzwilliam College, Cambridge. The event will be attended by RIBA President-Elect Ben Derbyshire and RIBA Chief Executive Alan Vallance. 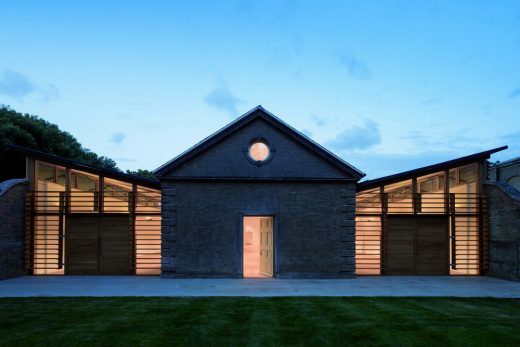 Regional winners will then go forward to be considered for a highly-coveted RIBA National Award in recognition of their architectural excellence, which will be announced on 22 June. 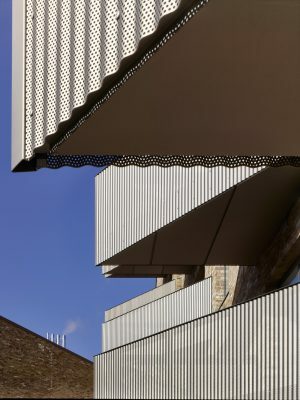 The shortlist for the RIBA Stirling Prize for the best building of the year will be drawn from the RIBA National Award-winning buildings later in the year.